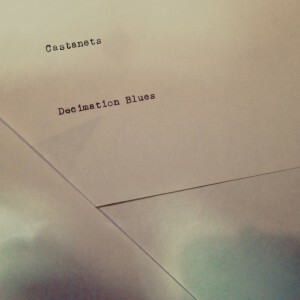 Castanets’ new album is out today. 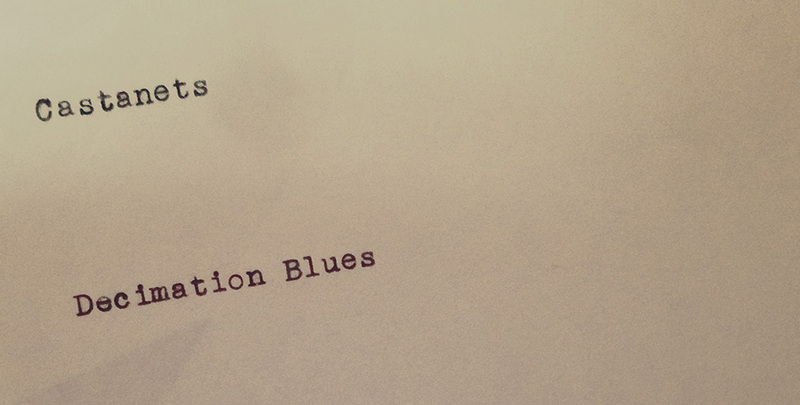 Decimation Blues [is] the music of a man who’s learned to live and build among the wreckage—twelve seemingly offhand, secretly meticulous tracks that we can hunker down in. “Still always good to be alone in someone else’s home,” Raposa sings. He’ll lend us his place, or teach us how to fix up our own. Come in out of the rain, put your shoes by the fire. The walls might shake, the wind might howl, but you’ll be safe here a while. Perhaps the complete lack of self-consciousness is at once the most impressive and strangest thing about the album. This is the sound of an artist open to a range of possibilities so vast they can’t help but contradict each other, and he just can’t be bothered by the confusion or annoyance those contradictions may cause his listenership. In the end it doesn’t matter anyway, as Raposa is already on to one of the album’s many moments of brilliance by the time our heads have stopped spinning from one of its moments of unfettered oddness. We have some limited edition marbled blue vinyl still left, which you can see and buy here.